I have been thinking about leadership and moral courage lately and came to remember a British general from the Second World War whose example of both is all to often forgotten even in military circles. I hope you enjoy. Field Marshal William Slim was one of the most brilliant commanders of the Second World War. He gets little press and there are not a lot of books written about him. Slim was one of those unique officers who served on the periphery of the British Empire as an office in the British Indian Army. He was a clerk in a factory who attended the University of Birmingham and commissioned as a reserve officer through its reserve officer training course; he did not attend Sandhurst, the British equivalent of the U.S. Military Academy. However, during the war a man who many would have considered an outlier rose from battalion to brigade and then Division command and became a general through wartime promotions all the while remaining a Colonel on the regular list as he served in the British campaign against the Italians in the Sudan and the invasion of Iraq. When Britain’s fortunes were at war were at their lowest point, and British forces were collapsing against the relentless Japanese advance in Burma Slim was called upon to stem the tide. He was assigned to command the Burma Corps which eventually became the British 14th Army. The army was sometimes better known as the “Forgotten Army.” He took command and had to conduct a 900 mile withdraw under desperate conditions. His Army was emaciated, poorly equipped and beaten, but his leadership during that retreat saved his army and kept their spirit alive. Slim has some of the most brilliant insights into leadership and I am just going to throw out one here. This is something that is really important and something that I think that we have lost all sense of in the West and why we struggle against insurgents who are inferior to us in every military aspect. We focus on the material first, technology has become our God, and it is our answer to everything. Likewise we often fail to emphasize the intellectual aspects of the military profession, the need to keep an open mind, to carefully examine doctrine and if it is not working to change it. Sadly, we all to often emphasize formulas, templates or abstract principles that that are hard to apply in the real world. Likewise we often adhere to doctrines that do not apply to the wars that we are currently engaged, or which might break out. Instead policy makers and strategists often try make the reality fit our templates rather than taking the time to really learn, and much of what we have to learn is not related to tactics or technology. With all our technological marvels we have also lost much of the sense of personal leadership where senior leaders actually know their soldiers. Slim understood the reality of these leadership principles because he took the time to know his soldiers. Because of the, his troops, in spite of the incredible hardships that they faced, knew that Slim understood them and would not sacrifice them needlessly. Slim trained his men hard in the tactics that would be needed to drive the Japanese from Burma and his leadership would pay off. His ability to hold leaders accountable for the welfare of their soldiers and his ability to relate to all kinds of soldiers made him one of the most unique and successful commanders of the war. 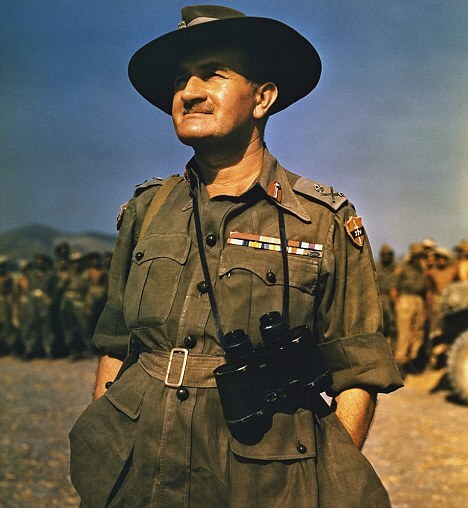 After the war Slim retired from active duty, but in 1948 Slim was called out of retirement by Prime Minister Clement Atlee to replace Field Marshal Bernard Montgomery as the Chief of the Imperial General Staff. He was the first officer from the Indian Army to hold that position, and indeed a rare feat for a man who began his career as a factory clerk. Darren drove me to target today! How about that..